Spent a couple of hours last Friday in Mill Creek Ravine, with the intention of ending my walk in Louise McKinney Park. 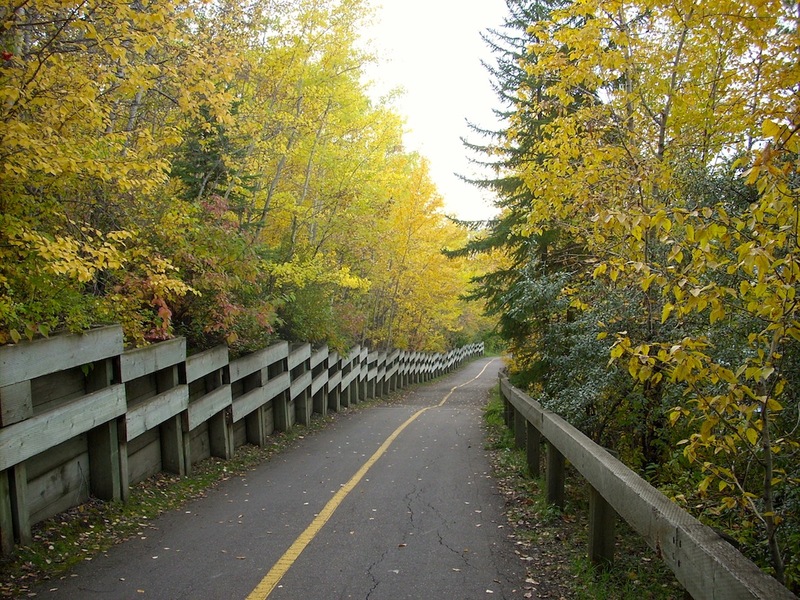 More than a wish to observe autumn’s gentle appearance in the ravine, I wanted to follow the river valley trail that leads to the Cloverdale Pedestrian Bridge at the edge of the North Saskatchewan River. I wanted to hear my footsteps on its wooden spans and take in the breath-quickening view, like I’ve done a thousand times before. To reflect on its importance to me and to the people who use the bridge everyday. And also, to the two years of public consultation on a SE LRT extension that will see the destruction of this bridge and a huge swath of parkland south of it, including the trail I had just followed from Mill Creek Ravine through the Muttart Conservatory grounds and Henrietta Muir Park. 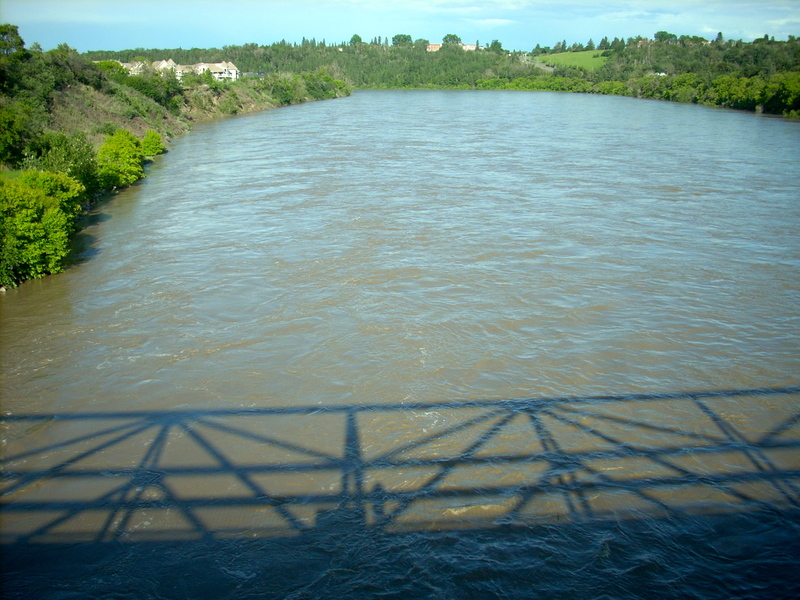 On September 11th, a forum specific to the downtown/Muttart corridor concluded with the attendees unsuccessful attempt to urge city councilors to reconsider the route through the North Saskatchewan River valley. It is a done deal, and it has always been a done deal. A shortfall of millions has delayed the project a year or two, but sometime in the near future, a devastation will occur in the river valley; an irreparable insult to all of us who truly value this quiet, well-used, and exceptionally beautiful green space in Edmonton’s downtown core. When I started walking in this area 20 years ago, there was virtually no development in Louise McKinney Park. It was a hill with so many wildflowers (and more than a few colourful weeds) it made this reluctant painter take out her brushes. 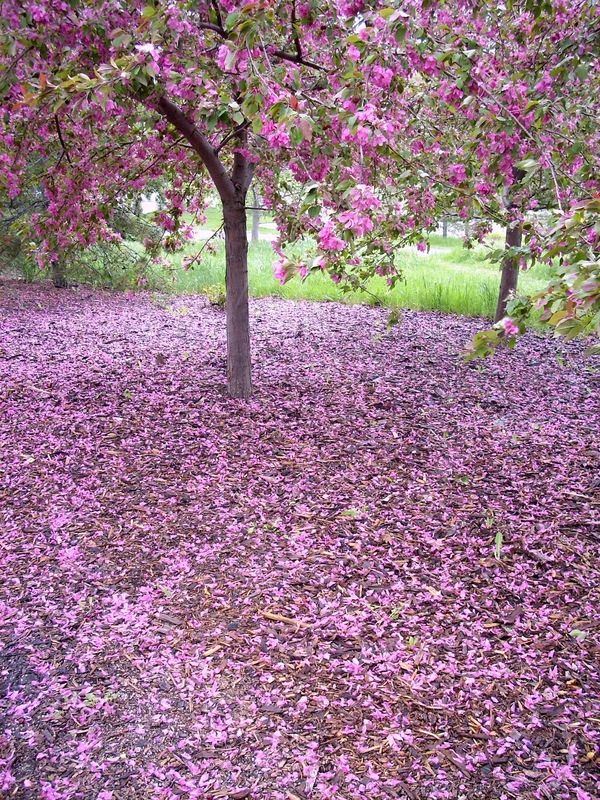 When the trails were laid and the flowers uprooted, I sprinkled seeds on the grass. Year after year, city councilors reimagined and reconfigured Louise McKinney Park, as if a peaceable stretch of bee-loud wildflowers and trail below our urban centre wasn’t enough. A clown-car of development followed, filling the tiny park with an array of attractions which cluttered but did not detract from the surrounding flora and fauna we are so ridiculously blessed to have in such close proximity to downtown Edmonton. And then it was decided that this park could be of further service as an exit point for the Southeast LRT, right through the tiered rose garden and apple trees. The Cloverdale Pedestrian Bridge, attached to the east end of Louise McKinney Park, is like an arm, languidly stretched across the river to another park, another trail. 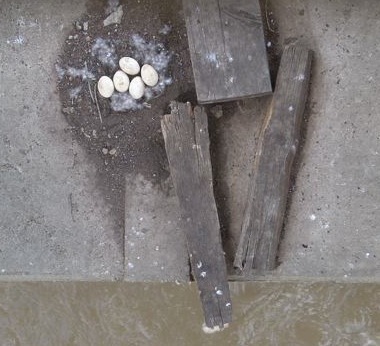 More than a bridge, it is a neighbourly promenade enjoyed by runners, walkers, cyclists, lunching urbanites, surrounding communities, musicians, dogs, photographers, painters, and a goose who lays her eggs year after year on a pillar below the north end of the bridge. It is of no use to the city planners, and so, in a year or two, it will be gone. A new bridge will be built in its stead to facilitate a slick and speedy progression of a train from one side of the river to the other, in stark contrast to the current bridge. The Cloverdale Bridge is no beauty. Rather, it is an unobtrusive, open-beamed span of wood and steel, with spectacular views of gleaming cityscape, riverbank, and rolling parkland. The creak and sway of its wooden boards is a soothing, natural thing, reminding us to be present in our thoughts, to slow our pace, if just for a moment. There is nothing natural about the rumble and vibration of a train slicing through the river valley at five minute intervals. A heap of environmental insults await the Muttart Conservatory grounds, Mill Creek Ravine and Connor’s Hill if the SE LRT extension receives full funding and ground is broken in Louise McKinney Park. In the days following the September 11th meeting, I have discovered that I am not alone in my love for the bridge or in my barely contained panic over its impending demise. 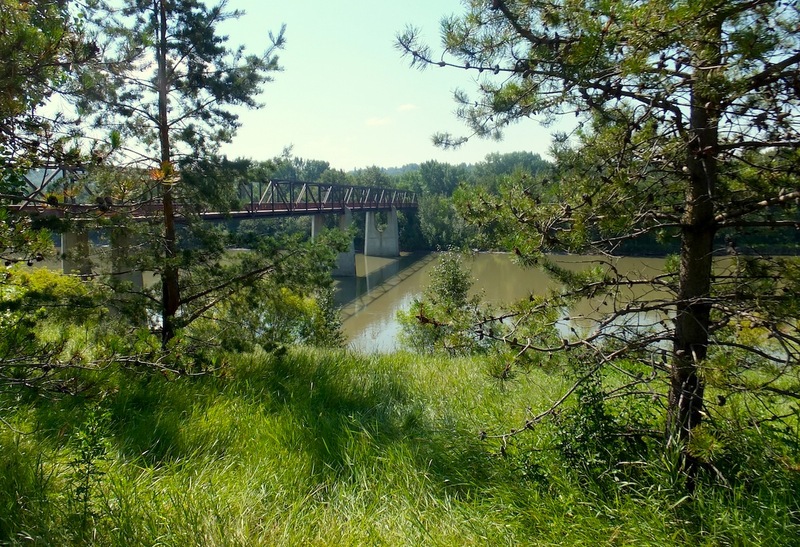 To my surprise, there is a Facebook group Save the Edmonton Footbridge, set up to raise awareness of the proposed fate of the Cloverdale Bridge and the adjacent river valley corridor. 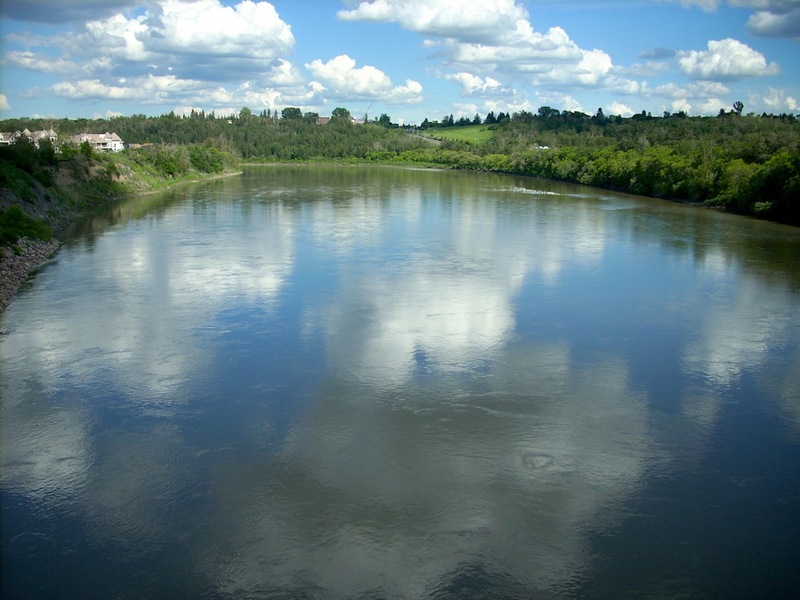 There is also a petition circulating to “...request that Edmonton City Council respect bylaw 7188 (North Saskatchewan River Valley Redevelopment Plan), and reconsider other LRT Southeast-West options that save the Cloverdale-Louise McKinney Footbridge and preserve our River Valley.” Of course I signed. In spite of the 600+ signatures, On September 18th, City councilors approved the route. Speaking of bylaws, in my slow (very slow) perusal of the 500-plus page Valley Line Environmental Assessment Report, I found it interesting that the City Manager will be seeking an exemption to Bylaw 2202, the rather pesky rule that restricts disturbances in natural areas. 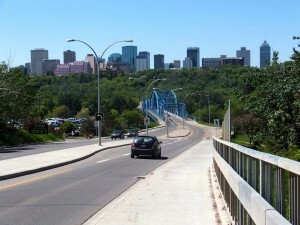 As for the Environmental Assessment Report itself, the diligent folks at the Save the Footbridge Facebook site unearthed another questionable manoeuvre courtesy of our esteemed City representatives: “According to Edmonton’s Guide to Environmental Review Requirements, environmental assessments are to happen in the planning phase, when ‘options are being investigated.’ This is so the findings can actually influence selection. However, the City commissioned the Valley Line Environmental Assessment three years after they chose a route.” I gotta wonder, did the selection then influence the findings? The report includes 92 pages of suggested mitigation measures, with the following proviso: “Some impacts cannot be fully mitigated owing to the size of the project area and the likely four-year duration of the construction period; however, these residual impacts are generally limited to the construction phase of the project.” Not so. Residual impact is a relative term. 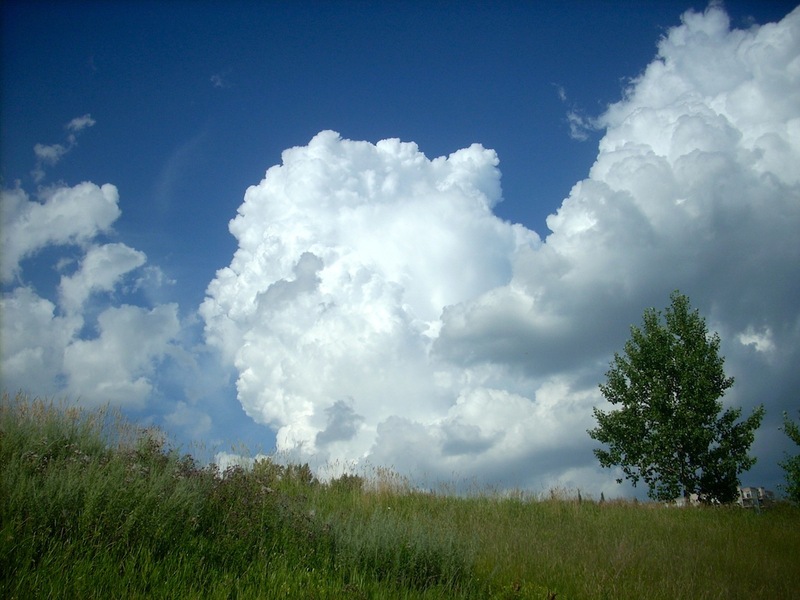 Slope failure, soil erosion, land and vegetation disturbances ~ these things can be mitigated, in time. Fundamentally changing the experience cannot. Irreversible harm will be done. The river valley, in this area, will not be the same. For some, in particular the Transportation Department, this is not a hill to die on, pun intended. As I have learned, my values rarely match those of the City Council and its administrators, although I do support the expansion of the LRT. Mass transit is a valuable investment, and environmentally, a much better option than bolstering car culture, but at the same time, preservation of our green spaces must be part of, if not lead the conversation. Unfortunately, just because the City of Edmonton exalts the river valley in its promotional materials does not mean it won’t turn around and contravene its own bylaws and supposed values and carve up the longest stretch of connected urban parkland in North America like a turkey. Councilor Ben Henderson stated: “There is no way to retrofit a LRT through a city without there being some negative consequences.” Got it. NIMBY. But let’s not be glib about those consequences. Some people, like me, like the residents of Cloverdale and Riverdale, and the thousands of Edmontonians who value this peaceful and bountiful stretch of the river valley believe the Valley Line route is unacceptable, and in violation of municipal bylaws. Initially, three corridors were considered: High Level/Whyte Avenue, Dawson Bridge/Riverdale, and Connor’s Road. Inexplicably, the Connor’s Road route (via Louise McKinney Park, Henrietta Muir Park, the Muttart and Gallagher Park) was chosen because, “…this corridor would require less disturbance as it traverses less parkland.” Really, I mean really? In Riverdale, there is already an existing road from downtown to the river valley, an existing shared car/pedestrian bridge, and…oh wait – The Riverside Golf Course. Sorry Connor’s Hill, I guess the ‘negative consequences’ of gouging a chunk of golf course outweighs that of ski hill. Edmonton Ski Club, take note. There are endless ways to feel bad about this. At best, it’s a clash of values, at worst, a failure of imagination and stewardship. Ultimately, I’d rather write about what I love, not what I fear. 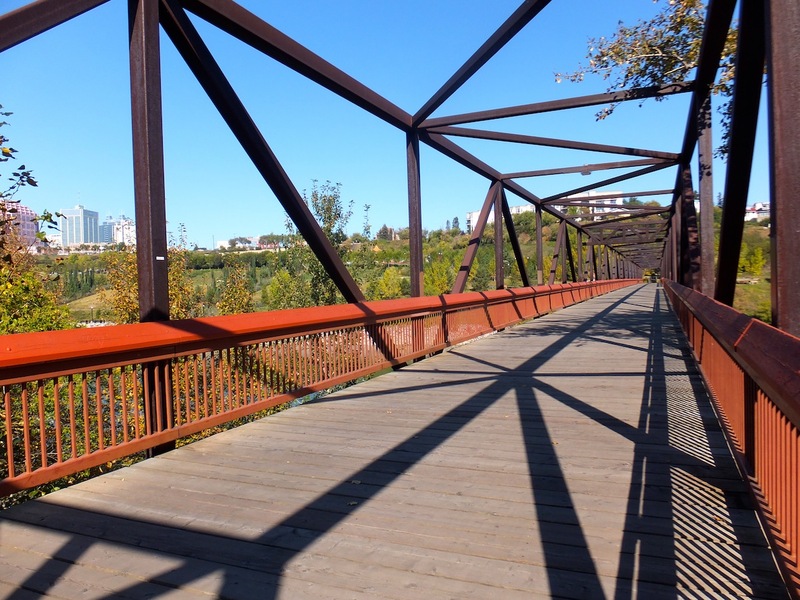 Thankfully, there is still much to love in Edmonton’s River Valley, including, for now, the Cloverdale Pedestrian Bridge and everything around it. One last note: Public protest can make a difference. See this article regarding the MacKinnon Ravine. Still fighting the footbridge battle. We are putting together an application to try to get the province to designate the bridge and area as historic resource. We will need pictures and stories to augment the application. We also have to make the case that the footbridge and environs (gardens and forest) are symbolic of wider trends in Alberta history. Any thoughts on that?